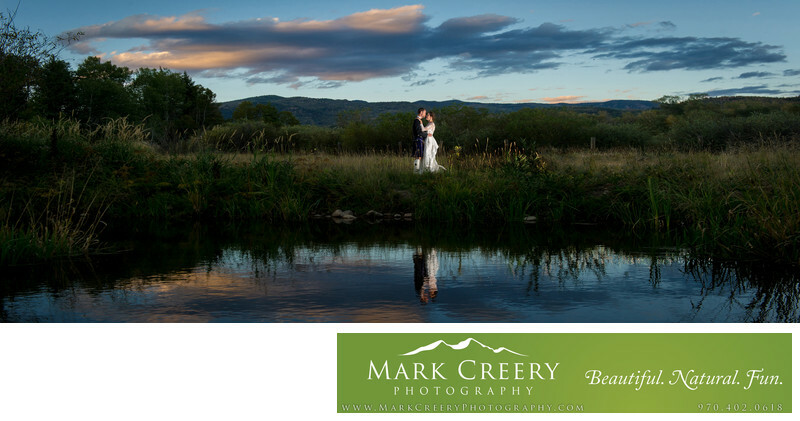 In this outdoor sunset wedding photo taken in the mountain setting of Steamboat Springs, I created dramatic portrait by using off-camera lighting techniques. I positioned a remote flash unit close to the couple on the ground and used a radio trigger to sync the flash when I pressed the shutter. Using this technique lets me be far away but still light the subject. I love this image for the subtle cloud colors that reflect off the pond, with the couple centered in this panorama. If you're looking for a wedding photographer in Colorado that specializes in outdoor mountain weddings, then look no further than me. I love capturing the beauty your mountain wedding has to offer.